It seems that in this day-and-age, more than ever, motorbike and bicycle theft are becoming more and more of an issue. Even with more advanced locking systems, it seems we are having issues keeping up with thieves with time and energy on their hands. 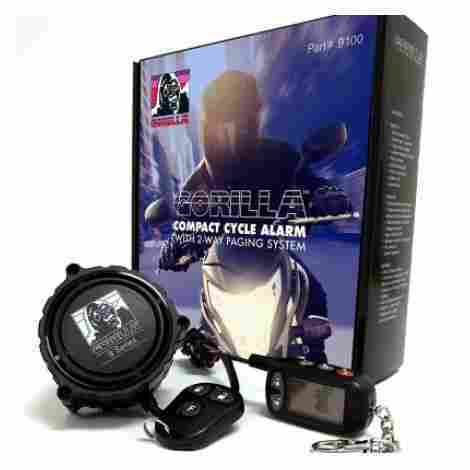 In this article, we discuss motorbike alarms that are highly rated by consumers and made by reputable companies. The options you will find here are technologically advanced and made of good materials. They are either wired-in sound alarms (some with tracking mechanisms) or disc-lock brakes. The wired-in, sounding alarm and tracking mechanisms can really be installed on most areas of the bike, however, most insurance companies require that they are “fitted”. Fitted essentially means that they are installed deep within the bike, usually an area that is really hard to get to in a short period of time. Fitting companies are fairly easy to come by and should be considered before insuring your bike. 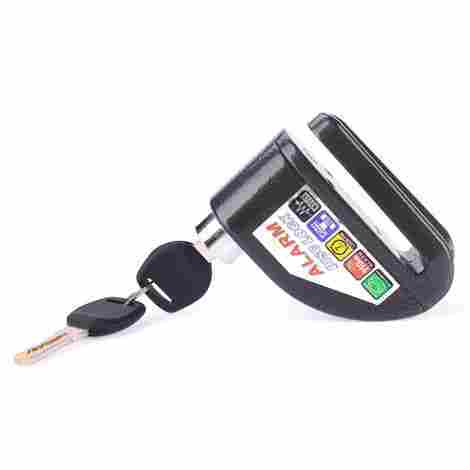 The disc-lock alarm is a device that will lock the disc of a motorbike to disable movement of the disc. It is wise to check your bike’s specifications to see how big of a disc-lock mechanism you will need. You can also check the disc-locks manufacturers’ website to find out if the disc-lock you are looking at will fit your specific bike. There are also “double locking-pins” available that are even more secure than single-locking pin disc-lock alarms. The double -locking pin disc-lock secures both at the top and the bottle of the pin for double security measures when locking up the bike. 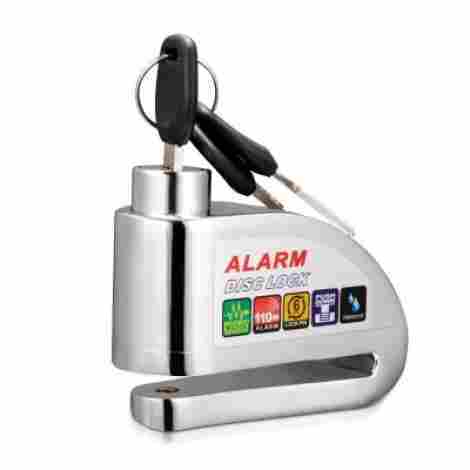 This alarm goes up to 100dB of sound, has vibration sensors, comes with a 5-foot lock reminder cable and with both an Allen key for disarming and a carrying pouch. Made of high end, alloy steel material. This lock is heavy duty. It has an incredibly strong body made of top of the line material. This material has been tried and tested to resist not only breaking but also weather damage. It has a 6 mm locking pin made of carbide and steel. It also has a 'class B' locking cylinder to stop a thief from carving into the unit and wrecking it. It is also water-resistant and ultimately rust-resistant. It can also be used on many different vehicles including bicycles, scooters, motorcycles and any other easily-moveable vehicle. There isn't much to justify here, this is very inexpensively priced. It is made of quality materials, it's also made by a very reputable company and has high consumer ratings. If you are looking for something that doesn't require wiring, this disc break is very inexpensive considering it's quality. This alarm is a wired-in, high-quality anti-theft system. It comes with a arming and disarming remote that works at surprisingly long ranges. It connects to a 12/24 volt bike battery and is super easy to install. Consumers typically complain that alarms either are too sensitive or not sensitive enough. This alarm has an adjustable vibration sensor for more fine-tuning abilities. It can be either increase or decreased depending on the buyers preference. Unlike with most disc-brakes, this unit has the ability to disarm or arm with the use of a remote. This can come in handy when needing to disarm the alarm on the bike when it may go off unnecessarily. It is also convenient when needing to arm the bike. One click of a button and the bike is fully secured. 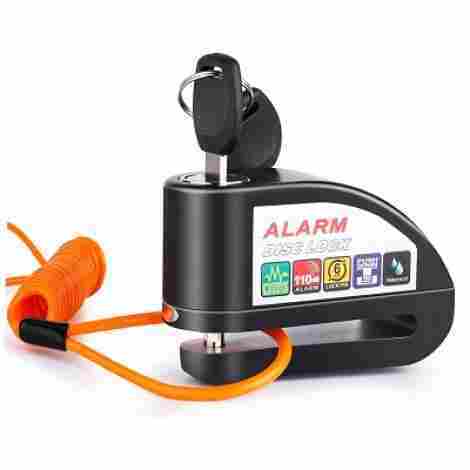 Similar to the disc-brake alarm above, this alarm doesn't need a lot of justification for the price because it is very inexpensive. Considering the convenience of this device and how inexpensive this alarm is, this one is kind of a no-brainer. This disc-lock is high-quality, German engineering. It goes up to 110 dB and has a reinforced steel push-pin for the highest level of security. This one also includes an orange reminder cable to remind the buyer to remove the lock before riding away and helping to avoid any potential damage. And it is made of the best materials to avoid wear and tear, as well as any potential weather damage. This is good for a couple reasons, the obvious being that it's a quality lock that will lost a long time but it's also heavy due to the forged stainless-steel so it requires a fair bit of strong movement to cut it off so if thieves use force to move it around to saw into it, it will definitely go off. This disc-lock has a very nice body, made of stainless steel. When the looks of the bike are a concern, this lock will add to the overall appearance of the bike. The body is German-made and, has a sleek and silver in body. Similar to the first disc-lock in this article, this lock is very inexpensive. With the beautiful design and being made of high quality materials, this lock is bound to last a very long time and look good while doing it. This alarm has a 120 dB siren, 10 more dB than the majority of sirens in this article. It has an LED warning sensor and light that helps scare off thieves and installs in under an hour. Unlike with most alarm systems, this system actually has 3 sensors included with it. It has a tilt-sensor allowing the alarm to know when the bike is being tilted from one side to the other. It has a shock indicator which make the alarm go off when the bike is suddenly moved without warning. And it has a 'current' detector which actually will alarm when someone is attempting to hot-wire a bike or scooter. If the concern is that there isn't much space available to install an alarm, this alarm is a better option. The alarm itself is only 2.75 inches in diameter and 1.5 inches deep. Despite it's size this alarm is super loud, one of the loudest on the market considering it's size. This alarm is a little more expensive than the other alarms on the market today. The justification for it is that it does have 3 sensors included in the package for three times the security. This alarm is meant for expensive bikes that require a very good alarm. It will keep the bike safe in numerous ways including the initial LED warning light, the 3 sensor system and the volume of the the alarm. 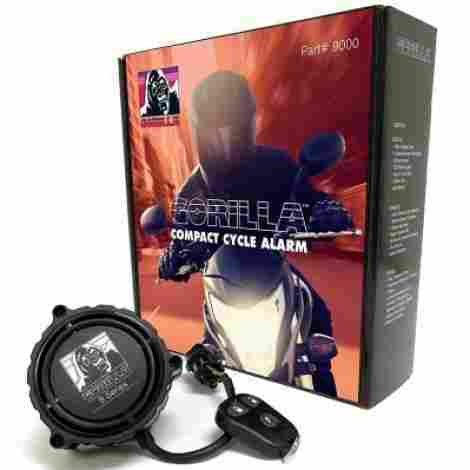 This alarm, like the previous Gorilla alarm, also has a 120 dB alarm included. It also comes in a 3 sensor alarm package to avoid tampering and hot-wiring. It also includes the LED warning light for added security and installs in under an hour. The paging system connects up to half a mile away from the location of the bike when activated and triggered. There is also customized paging options, either warning through beeping or vibration. The LED screen on the remote will light up when the alarm has been triggered. Typically these alarms only have a range of 30 days to 1 year of warranty. Gorilla offers a two-year warranty with their alarm. This is a testament to how confident they feel about the product that they are selling. Again, as well the other Gorilla security system, this alarm is on the higher end in price range due to all the added features. The convenience of being able to monitor your bike from half a mile away is unique and the two-year warranty definitely helps put piece of mind when investing in a more expensive alarm system. This disc-lock has a strong steel, class-B interior with a waterproof exterior. 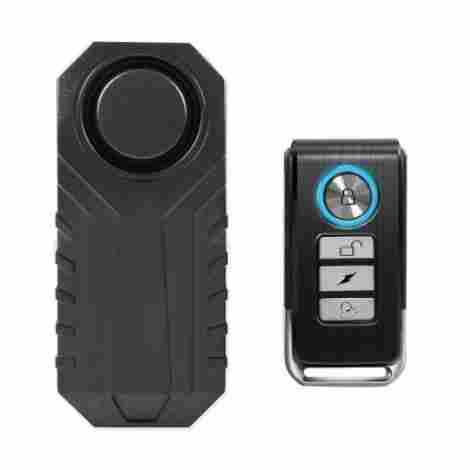 It comes with two keys (not Allen, but actual keys) and 120 dB alarm (10 dB higher than most disc-locks on the market). It is made of carbide and stainless steel. This disc-lock has the double locking system mentioned earlier in this article. The pin locks at the top and the bottom making it twice as hard to break. The pin itself is also made of nickel and stainless steel, making it super strong. All of the disc-locks in this article are waterproof but this lock can actually sit submerged in water for 48 hours and still work. It's extremely waterproof and ideal for very wet and high-humidity climates. This disc-lock, though still very inexpensive, does sit in the middle price range. It is slightly more expensive than other comparative locks however is extremely competitive considering it's super waterproof. If water damage is a primary concern, the price is reasonable and this lock is the choice for you. Of all the alarm systems in our research, this alarm-system was the highest rated. The disc-lock has a 110 dB alarm, it also comes with a reminder cable (2 m in length) and can be used on numerous vehicle types. It is made of stainless steel and is silver in colour. Unlike standard disc-locks, this one comes with a fairly large locking pin meaning it can be used on thicker disc-locks. The pin itself is made of hardened stainless steel so it's also very strong. All the alarm systems in this article are made of quality materials however this particular disc-lock has the highest reviews of all the other alarm systems because it really is known to last a long time. The alarm system has the lease amount of negative reviews as well. This disc-lock is the most expensive disc-lock in this article (and in comparison to the disc-locks on the market) which is most likely indicative of good quality and long-lasting use. Because this lock lasts longer than most other disc-locks it's worth the extra cost. This is a wire-in anti-theft system. It comes with two remotes (which are different colours to avoid mixing them up) and has a memory card to save any preference settings. The on/off feature can either be done manually with the remote and also automatically when the bike is turned off. It works with a 12-Volt DC battery source. One of the loudest on the market, this alarm goes off at 125 dB. This is ideal for noisier environments (like downtown city living) or longer distances (like when the bike is parked further away). The remote works as a keyless start and stop. No key required to start the bike or scooter making your bike far more technologically advanced. 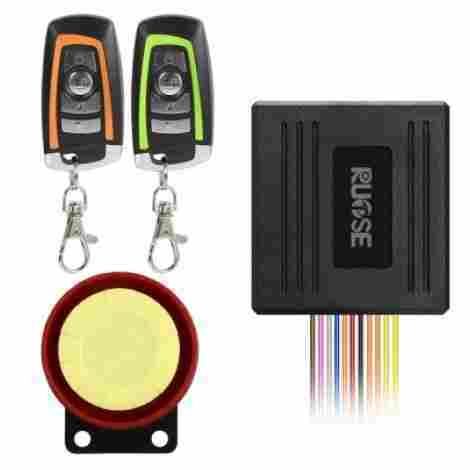 This system is very inexpensive considering it's capabilities, more similar in price to disc-locks than to wired-in units, this alarm system is a budget-friendly alternative to alarm systems. This alarm has a whole wack of functions. It is small and compact and ideal for not only motorcycles but also for bikes too. It is sleek and black, and has a trendy little remote control with a sleek blue under-light add-on. It requires so little power from its battery pack that this alarm, with regular usage, can last over 6 months. This little alarm actually has noise reduction capabilities that allows it to recognize false triggers. It has up to 7 different levels of sensor sensitivities and 6 different bell sounds for customizable setup. It even has an emergency function to help call out for help if ever in an accident or emergency. This system has either a tie-strap or an adhesive back depending on what you are installing this to. It can be used easily with either a motorbike or bicycle easily and with it's customizable features the unit is incredibly versatile. This unit is kind of a unique alarm, not being all that similar to either disc-locks or wired-in alarm systems. Because of how versatile it is and how different it is, this falls right in the mid-range of price point for this type of system. If technology is your thing or you like customization, this is your alarm system. 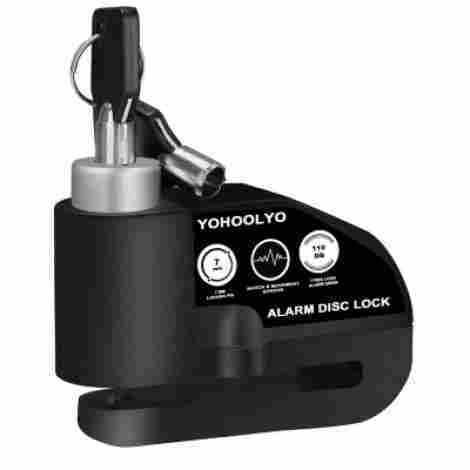 The final security system on our list is the Yohoolyo Motorcycle Alarm system. This alarm rings at the standard 110 dB volume. It has a 7 mm lock pin which is about standard and comes with two keys. 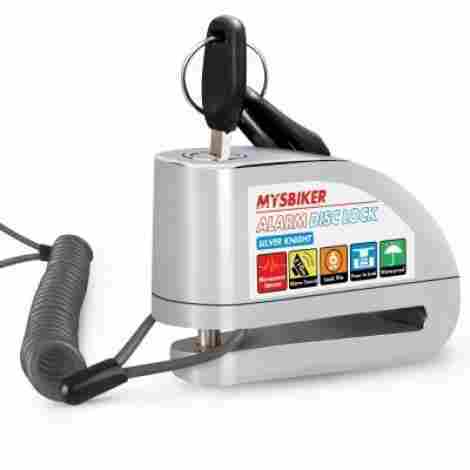 It can be used on all types of vehicles including motorcycles, bicycles and scooters. This alarm will initially omit three warning beeps in order to give the thief a chance to walk away. If it senses any more tampering it will then let out 10 second long intervals of beeping at 110 dB. This is convenient because if the thief realizes the vehicle has an alarm on it with the warning beeps they may walk away and the rider does not necessarily have to put themselves in harms way to stop the thief from stealing the vehicle. You would think this is standard in all devices however numerous products have reviewer and consumer complaints that the batteries are really hard to replace. With this unit the batteries are accessible when disarmed and easy to get out and to put back in. This is one of the most inexpensive disc-locks on the market. There is no justification needed here. It is highly-rated, very little consumer complaints and a very nice price tag. If budget a concern, this system will work well for you. In conclusion, there are two very different types of motorcycle alarms and depending on what you are looking for both are very good in keeping your bike safe. A combination of the two can also add even more security to your bike (which we recommend). Considering the disc variety tend to be a little less expensive, combining the two won’t set you back too much and will help keep your bike where it belongs. Security systems are also usually required with insurance companies before they will insure your bike as well and if they are not alarmed there is a chance that they will still cover you but increase your insurance premiums as a result of it. Wired-in alarm systems tend to be a little more expensive but harder to tamper with and usually have more advanced features (like remotes and auto-start features). 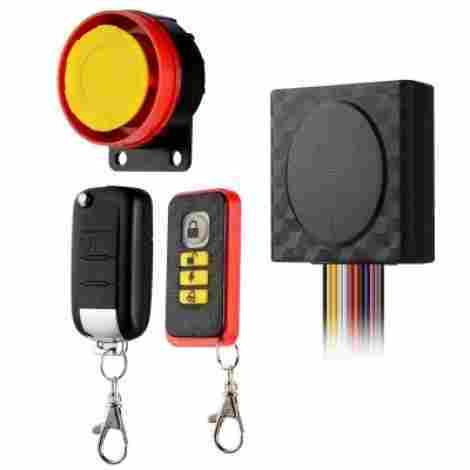 Typically wired-in versions are easy enough to install with help from the instructions or a YouTube video however it is in the motorcycle owners best interest to have a professional install the alarm correctly. This will not only make sure that the alarm is installed correctly but also stop potential damage from incurring when attempting to install it on their own. We don’t want to be snipping incorrect wires and wrecking the bike. A reminder cable is also something that many people would not normally think of when buying a disc-lock however could not only save from potential damage to the bike if the disc-lock is forgotten about but also avoid any potential accidents and harm to the driver when accidentally crashing due to the lock still being on. Something else to consider is the price of what is being purchased. Disc-locks are generally far less expensive but still very effective for securing the bike however they typically don’t come with handy features that the wired-in variety has. Finally, sensitivity cannot be forgotten about. Sensitivity is the primary feature of security systems. Not being sensitive enough will defeat it’s purpose and being too sensitive could potentially be a headache for you and your neighbours (if small, unnecessary things are setting it off). We hope this article helped weed through all the options available to you and helped you decide on a security system that is best for you. Happy travels! This is probably the most important aspect of the security system. A cheap lock is wasted money, if the thief has even very little supplies it can be fairly easy to break a cheap lock. Even the most sophisticated bike locks can be sawed into with enough time and energy. A security system needs to be strong enough materials that it can withstand tools. It also helps the life of the system if it’s made durably. The secondary consideration is the volume that the security system can reach. If the security system is too quiet it won’t draw enough attention to the person attempting to steal the vehicle. We looked at alarms that at least were over 100 dB. Anything under 100 dB would be pointless and would more than likely be a waste of money. Volume is imperative in order to draw attention to the crime taking place and hopefully thwart off the thief. Though most pins are around the same height in this article it is still something to consider. Standard pin size is between 7 and 9 mm but can get upwards of 15 mm. If the pin is not long enough it may not fit onto the disc and if too tall of a pin is used it give unnecessary clearance for a saw to fit in. It is important that the space between the lock walls and the disc are snug enough to avoid a saw getting near the pin but also not so tight that it is difficult to get the disc-lock on and off of the motorcycles disc. If someone is forgetful and will forget that the disc-lock is still on the disc it could potentially really damage the bike so having the reminder cord is an important feature to look for when buying a disc-lock. If the disc-lock hits the connecting arm on the bike while it spins around the disc this could break the connecting arm and also potentially really hurt the motorcyclist. This is, again, something to consider when looking for an alarm system. Price is something we look for before we look at everything else which is backwards. Though people on a budget may have to narrow down their requirements for additional features. You get what you pay for generally and quality can come with a price tag. If the alarm system is really needed and price is something that is important then a disc-lock may be a more favorable choice to a wired-in security system. This article does highlight some very inexpensive systems for good products. Insurance carriers will often require that the motorbike or scooter have a security system on it in order to insure it. This makes sense considering they are insuring a risk that is a lot riskier when there’s nothing to stop someone from just lifting or walking away with something fairly easy to steal. Looking for an alarm system that fulfills the insurability requirements is important. Having a reliable security system will also help to ensure that you won’t have to file any insurance claims. If the driver is not electronically savvy then buying a wired-in security system may not the best option. Alternatively, there are some security systems that are easier to wire in than others. It’s important to consider how complicated the wiring system is, how confident the installer is with this type of mechanics and whether or not they own the necessary tools for the job. If there is little chance it can be done and the resources are not available to have one installed then it may make more sense to stick to disc-locks. It’s important to note here that if the security system is installed incorrectly it can end up damaging the bike as well. It’s always recommended that they be installed by professionals. Living in the country where less people are around but maybe more windstorms are present vs living in a city where more people are around but more blockage of wind by bigger buildings create very different environment for accidental alarm activation. If the environment changes quite frequently then having adjustable sensitivity may be necessary. It is something that should be considered especially in places with numerous people who will easily become annoyed if you cannot hear your alarm going off but the neighbors can (like in apartment complexes). Considering the sensitivity of the alarm and the environment that you live in is something important to consider. dB– dB stands for decibel. A decibel is a measure of sound. Disc Brake- a metal disc or router that moves in tandem with the wheel. Typically brake pads press against the disc to slow down the wheel thereby stopping the bike. Battery Tender– a device that plugs into an outlet to keep a battery charged and to stop the draining of a battery. It is typically used when something environmental or requiring power is affect the batteries charge. Q: Are disc-lock alarms water resistant? Not all of them but most are. Mentioned later in this article, it is wise to keep the lock under the mud guard will help protect the alarm from unnecessary water damage. Then there are some that are fully water-proof (like the IZTOR listed above) which can be completely submerged into water and still work after. It depends on the model. This will be listed on the buying website or on the box of the security system you are looking at. Q: Are disc-lock alarms okay in any kind of weather? Most are rated for all kinds of weather conditions. It wouldn’t be often that you would find yourself riding a motorbike in the winter but for long road-trips it is important that the alarm being used can withstand some rougher conditions. Most can sustain rain and dust though. Q: Can I use more than one disc-lock at a time? Absolutely, you immobilize the bike by attaching the disc-lock to one of the discs on your bike, because your bike has two discs you can attach one to the front and one to the back of your bike for double security. For even more security you can also install a wired-in system as well for three times the security. Q: Is there an ideal location to attach your disc-lock to? Anywhere on the disc works however it is wise to attach the disc-lock under mud guard to help keep it out of the rain. As mentioned above, the locks are typically waterproof however if continually drenched in water the device can get wrecked. The mud guard will protect the device from constant water exposure to preserve the life of the disc-lock. Q: How high should I be setting my vibration sensitivity when fine-tuning my alarm? This is entirely up to you. You may not want to set it too high as it may set off the alarm prematurely or when not necessary. This is more of a trial and error type process, see what works best for you to avoid the feature not working at all and from annoyingly happening constantly. Q: Where do I go to get my alarm installed? A disc-lock can be installed by you but the wired-in type typically needs to be done by a professional. A google search in your area for “motorcycle alarm installation near me” will show you a list of places that offer the service. It also is a good idea to ask if the store you are buying from (assuming you are not buying it online) offers the service complimentary or for an additional fee. Q: Are motorcycle alarms worth the money? Considering the price of your bike and how very little alarms cost, it can’t hurt. But also, there are some very good wired-in and disc-lock system on the market. For additional security you can use both. Yes, ultimately a motorcycle alarm is worth it if there is any chance that someone may attempt to swipe your bike. And again, there may be a requirement for it by your insurer. Q: How long do alarms sound before it resets? This ranges but typically it is between 10 and 15 seconds. Usually it will go off between 3 and 5 times before completely shutting off unless continual vibration occurs then it will continue to go off until either the vibration stops or the alarm is disarmed. Q: What happens if I lose my keys? Some keys can be recut (the barrel cut key type) however going directly to the manufacturer, you can get replacement keys. Q: What do I do with the disc-lock when the bike is in motion? Most are small enough to hold in your pockets but to avoid losing it there are numerous hooks around the bike that can hold it when in motion. One common area is your helmet hook usually an included feature on most motorbikes. Hooking it there during the ride or in any storage area would be your best bet. Q: Can the battery hosing be easily tampered with? No, the battery hosing cannot be tampered with without setting off the alarm. This is something most motorcycle alarm companies consider when making the lock. Bikesocial workshop- How to fit a motorcyle alarm.